I found this product easy to find, easy to open, and most importantly my kitten loves eating this brand. The only thing I didn’t like was how much oil was in it. Dine tender chicken was not a big hit compared to other brands of cat food.With the price of Dine cat l thought she would love it,but no not really! 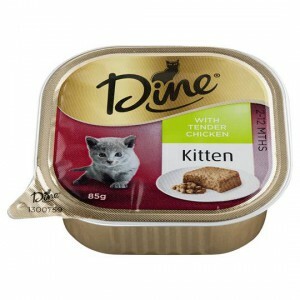 How would you rate Dine Kitten Food With Tender Chicken?